Islamabad: Thousands of Pakistanis converged on the capital Monday to join a march planned by Sufi cleric Muhammad Tahirul Qadri calling for the indefinite delay of elections and a crackdown on government corruption and inefficiency. The cleric, who has won instant celebrity since returning home from Canada weeks ago calling for electoral reform, wants an interim government to root out graft and mismanagement that have caused chronic energy shortages, stunted growth and allowed crime and a Taliban insurgency to flourish. His calls have divided Pakistanis. Some see him as a reformist champion, like 25-year-old Gulshan Irshad, a public school teacher in the central Punjabi town of Gujranwala who says she hasn’t been paid in two years. 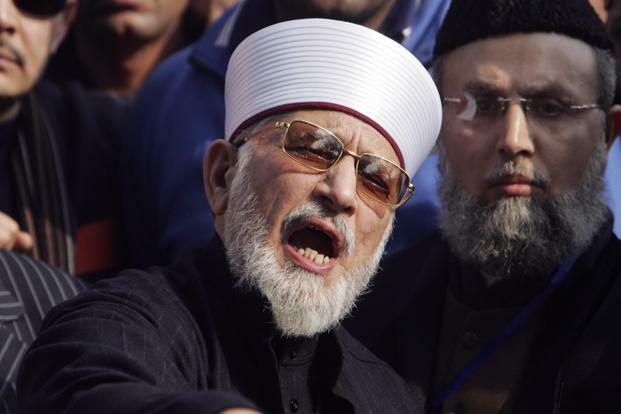 Others see Qadri a potential stooge for the military, which has a history of coups and interfering in elections. They say his demands are unconstitutional and replacing an elected government with an unelected one will not help accountability. Leading television anchors have questioned the source of his funds for a lavish media campaign and fleets of buses to transport supporters. Qadri says most of the money came from donations from those fed up with the current administration. Police in full riot gear were stationed on street corners in Islamabad where shipping containers blocked off key routes to government offices and embassies. Qadri has promised to bring a million people on to the streets to protest, but his march appeared limited to several thousand as of 0900 GMT. Activists were busy setting up microphones and soup kitchens for the demonstrators. “I brought blankets and food with me, believing we will stay and protest for two or three days,” said Qamar Ghazi, 30, from the northern town of Mianwali. The protest comes on the heels of a three-day sit-in by Hazara Shiites in Quetta, capital of eastern Balochistan province, protesting against one of the worst sectarian attacks in the country’s history in which 96 of their community were killed.